Pakistan, in reality ruled by the military, has for decades supported militant islamist movements in a perceived threat from it's arch-enemy India. The militants have fought wars on Pakistan's behalf in the Kashmir conflict area and also in Afghanistan during the Taliban regime 1996 - 2001. There the Taliban was seen as a guarantee against Indian influence in Afghanistan and for Pakistans need of "strategic depth" in case of an open conflict with India. But the aim of the islamist militants, the Taliban and the AlQaeda movement, is to fight Western values of democratic, secular and open societies. Pakistan has been double-dealing, on the one hand supporting the militant extremists and on the other, under US pressure, pretending to fight them. For the Pakistani military and the all powerful intelligence bureau, ISI, it is about money. During the years 2002 - 2006 the US Bush administration paid Pakistan for fighting the Taliban, alQaeda and oter extremist groups, more than ten billion USD and half of that sum went to the military for "services rendered". That led to Pakistan's weapon shopping spree, among others the Swedish "Erieye" radar system from SAAB for one billion. But the "Erieye" system detects flying objects, i.e. Indian airplanes, and is not developed for a fight against a land-based insurgency. SAAB is now trying to sell "JAS Gripen" fighter aircraft to India. This will of course put constraints on Sweden's abilities during it's tenure now as European Union Chair to push for strong, unpartial demands to the countries in the region to improve the democratic situation. The Pakistani support of the religious extremists backfired. 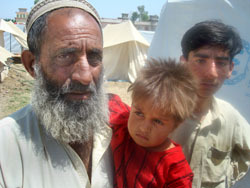 When their attacks against Pakistani targets became too threathening, the army launched a counter-offensive at the end of April 2009 to retake the Swat valley, about 200 km:s northwest of the capital Islamabad. An indiscriminate warfare resulted in more than one and a half million displaced in less than one month. But testimonies from displaced as well as people inside the valley give the picture of a "bogus war". The aim of the Pakistani army seems to be not to totally destroy the militants but just to force them into Afghanistan. Their continued fight there against US and ISAF troops, whereoff the Swedish contingent in the north is a part, is seen by Pakistan as just a "freedom fight", worthy of support. 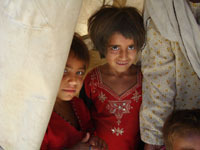 Increasing security threat from extremists has forced international humanitarian organizations, NGOs and even government-run bodies to scale down or suspend activities across Pakistan. Another part of Pakistans double-dealing was the illegal detainment by the intelligence agencies of thousands of innocents, claimed to be terrorists. 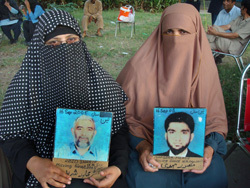 Many were handed over to the CIA in exchange of money as part of Pakistans bogus parttaking in the US "war on terror". Still, according to Amnesty, close to 500 confirmed persons are detained, illegally incarcerated by the security services, without trial or even any official statement to their relatives that they are kept. Without a strong, civil and democratic society to rein in the military, there are no possibilities to stop the sabotage by the militant extremists of a peaceful democratic development in Afghanistan, or prevent Pakistan from descending into total chaos.